Kent’s Westwell Wines is situated near the ‘Pilgrim’s Way’ on the chalk slopes of the North Downs, the historic route used by pilgrims travelling to Canterbury. The vineyards are planted with Chardonnay, Pinot Noir and Pinot Meunier for the production of sparkling wine, the Chardonnay planted on the shallowest chalk, with a high proportion of flint. For still wines, Ortega, a cross-bred variety popular in England’s vineyards because if is early-ripening, makes both dry and sweet styles – as well as an amphora ‘orange’ wine, which I have not yet tasted. In 2016, the estate was sold, with winemaker Adrian Pike becoming its new managing director. Having previously worked at the organic Davenport estate in Sussex, Pike appears to have introduced significant changes to the winemaking recipe, with lower dosage for the Westwell Brut, more use of reserve wines, and continuing experimentation to add to the amphora wine, with talk of a skin-contact rosé and zero dosage sparkling cuvée if climate permits similar levels of ripeness as these vineyards have recently achieved. Pike and vineyard manager Marcus Goodwin – who had also worked at Devenport – are also minimising use of synthetic sprays, in an organic-facing direction (though not farming organically as yet). I was very impressed by these wines, the sparkling wines in particular of not only very fine quality, but pitched in a style that is very pure, very refined, but approachable, with a sense of generosity to their balance. Clearly, this is an estate prepared to match to its own beat, and one to watch. Westwell’s wines are sold via their own online shop, and in local retail outlets around Kent. They are also available in many local restaurants. (2019) This non-vintage blend of the three traditional Champagne varieties (45% Pinot Noir, 45% Pinot Meunier, 10% Chardonnay) contains 20% reserve wines and is aged for a minimum of 18 months before disgorgement It is a lovely wine, with the abundant fruity charms of the Meunier giving it great likeability. There is a lovely doughy autolysis, yeasty and inviting, but it is a bright orange and lime fruitiness and acidity that drives the palate. There is plenty of refreshing, zippy acidity, but it that slightly riper, more exotic citrus rather than lemons, which adds to the all-round charm and appeal. (2018) This is close to equal proportions of Chardonnay, Pinot Noir and Pinot Meunier, with 50% of the Chardonnay fermented in older Burgundian barrels followed by 20 months ageing in temperature-controlled cellars prior to disgorgement. The bubbles are small and persistent, the nose racy and refined, with a little biscuity richness over crisp lemony fruit. The richness becomes more evident on the nose, yeasty and quite complex. In the mouth there's a fat lemony fruitiness that is both keen and taut, and quite mouth-filling, a fine mousse and plenty of fruit at the core of this. Balanced and long, a dry, chalky sense of minerality emerges, and a low dosage here I think, keeping this ultra crisp in the finish. (2019) The 'Classic Ferment' differentitates this from an amphora-made Ortega, this made in a combination of stainless steel tanks and older oak barrels. It's pretty much dry take on Ortega, a German crossing of Müller-Thurgau and Siegerrebe that is often used to make sweet wines. There is some sweetness here, but offset by a considerable spine of pithy lemon and grapefruit, though the aromatics to flit nicely around tropical peach and nectarine, before that sour lemon tang of the finish. 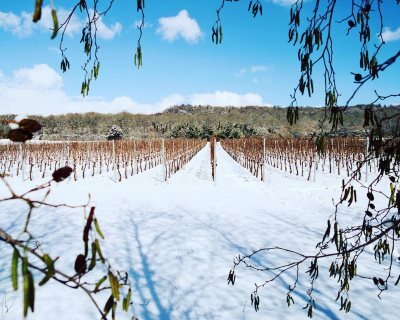 (2019) Selected parcels of Ortega were harvested late to give 150g/l residual sugar, and treated like an ice-wine with the must chilled to -8ºC before pressing and fermentation and ageing in barrel for 6 months. This has no botrytis, but instead a bright orange and lemon sherbet nose, immediately reminiscent of a Canadian icewine, but less rich and unctuous. That freshness and zip counterbalances the sugar very nicely in the mouth, with pear juice and peach flavours, a touch of honey, and a cleansing lemon zest acidity. For lighter desserts, and though rather expensive for the half-bottle, a lovely wine. I really enjoy discovering the property and wine from John and Rids Rowe. “Good luck” to John and Rids Row, thank you to you to help us discovered new wines.